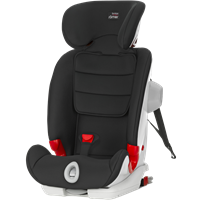 London, January 2017 – Britax Römer has unveiled the ADVANSAFIX III SICT car seat, a premium addition to its range of Group 1-2-3 child car seats. 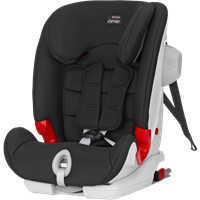 As the latest in the popular ADVANSAFIX series, the new seat provides superior safety for children aged 9 months through to 12 years (9kg-36kg). The ADVANSAFIX III SICT is ideal for parents looking for a premium Group 1-2-3 child car seat. Installed with top tether and ISOFIX, the seat ensures a strong and stable fit in the car, while the 5-point harness can be used up to 18kg. The seat then transforms to a highback booster seat for older children from 15kg to 36kg until they no longer require a child seat in the car. Deep, softly padded side wings and SICT technology provide excellent side impact protection, while multiple recline positions mean children of all ages will be comfortable whether playing or sleeping. When using the 3-point seat belt for securing older children, ADVANSAFIX III SICT offers optimal lap belt positioning thanks to the latest Britax Römer SecureGuard technology (patent pending) which adds an extra 4th contact point to the standard 3-point adult seat belt. This 4th attachment point helps to keep the adult lap belt in an ideal position over the pelvic bones and to reduce abdominal forces in the event of a frontal collision by up to 35%*, even when the child moves around in the seat. “We have updated one of our most popular child seats for parents who need a seat providing both safety and longevity,” said Rainer Stäbler, Managing Director EMEA, Britax Römer. “The new features of the ADVANSAFIX III SICT, particularly the transformational element to highback booster, meet the ever-changing needs of growing families and their lifestyle choices”. ADVANSAFIX III SICT is now available in seven colours from £250 at selected retailers. Highback boosters provide a safer alternative to booster cushions. They offer three forms of protection: the seat shell provides head to hip protection; the upper and lower belt guides provide correct positioning of the seat belt; and the padded headrest provides safety and comfort for the head and neck. With stylish new cover designs and soft fabrics on the headrest and performance chest pads, children can travel in comfort and style. The cover sets are machine washable and can be easily taken off without removing the harness.